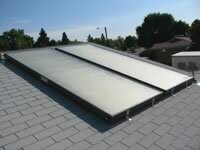 Solar thermal devices use the heat from the sun directly to heat water or air. They are most often used in businesses and homes to provide hot water, but can also be used to heat swimming pools or as space heaters in homes. Most solar water heating systems for buildings have two main parts: a solar collector and a storage tank. The most common collector is called a flat-plate collector. Mounted on the roof, it consists of a thin, flat, rectangular box with a transparent cover that faces the sun. Small tubes run through the box and carry the fluid – either water or other fluid, such as an antifreeze solution – to be heated. The tubes are attached to an absorber plate, which is painted black to absorb the heat. As heat builds up in the collector, it heats the fluid passing through the tubes. 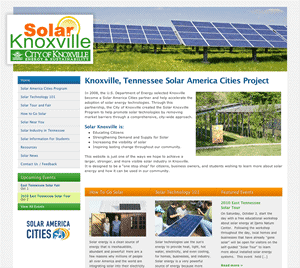 Here in Tennessee, one of the most common solar hot water systems is an active, indirect solar hot water collector, which pumps a mixture of water and non-toxic antifreeze to the roof where it is warmed by the sun. The warm liquid then flows to a hot water tank and heats the water in the tank—this means that the traditional water heater won’t have to use as much—or any—energy to heat water for your shower or dishwasher. 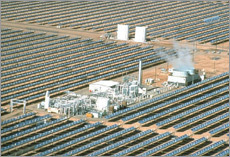 The Solar Electric Generating Station IV power plant in California consists of many parallel rows of parabolic trough collectors that track the sun. The cooling towers can be seen with the water plume rising into the air, and white water tanks are in the background. Another type of solar thermal technology is Concentrated Solar Power or CSP. CSP technologies use mirrors toreflect and concentrate sunlight onto receivers that collect the solar energy and convert it to heat. This thermal energy can then be used to produce electricity via a steam turbine or heat engine driving a generator.